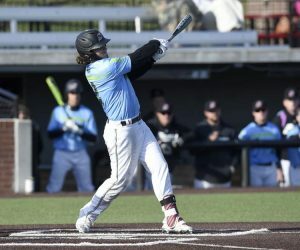 CARBONDALE — The SIU baseball team may still have to catch up to Missouri Valley Conference favorites Missouri State and Dallas Baptist on the field, but the program got a big boost off the field courtesy of athletic director Jerry Kill. Kill’s fundraising, and a conscience investment in the program, led to the Salukis adding a BATS! Video System and FlightScope analytical system in the offseason. The programs are linked to six cameras around “Itchy” Jones Stadium and provide coaches and players an incredible amount of data to help them keep up with the big boys. The new video system, which is used by almost every Major League Baseball team and several of their minor league affiliates, will give the Salukis unprecedented looks into contact location, pitch velocity, swing zones and more. Cameras were mounted near the batter’s eye in center field, in left and right field to account for right-handed and left-handed players, and on the roof of the press box. A new analytics software called FlightScope will provide coaches and players almost instant spin rates, release points and pitch breaks for the team’s pitchers. Hitters will be able to examine their exit velocity (speed of the baseball off the bat), launch angle and more right after every workout. The system is portable, giving the Salukis the ability to examine their workouts on the field, in the batting cages behind the clubhouse and at their indoor facility in Carbondale.